Nature is cruel indeed. We're created with the capacity to develop huge egos and accomplish great feats. Then ultimately we lose our entire being. In spite of our capacity to alter nature (test-tube babies are now common), we are subject to some of Nature's eternal laws. Bodily deterioration is one, immutable reality. Walt Disney may have hoped to have his cryo-frozen body return to life when technology advanced. But as of this date, no one has come back from the apparently final, inert state. About the clutches of the grim reaper, the comedian George Carlin joked, "It's definitely on your schedule." Humor is one good defense. Some defenses against death, like humor are helpful, while others, like denial, have been portrayed as destructive. According to cultural anthropologist Ernest Becker, denial culminates in wars. In his 1973 Pulitzer Prize-winning book, The Denial of Death, Becker describes how dualism (the division between body and symbol), coupled with our refusal to accept the body's demise, causes us to concoct heroic belief systems. He proposes that the conflict between one belief system and another leads to wars. In this election cycle, it's important to note that we are vulnerable to leaders who motivate by means of harnessing belief systems to fight for a cause. Becker suggested that creative people manage to integrate the dualism through means of their creative projects. In essence, life can be viewed as a creative project in which each of us has the potential to participate. In other words, heroism is embodied in everyday life. Through our good deeds to help others, we make the world a better place and create positive memories. Memories are the symbol through which we live on (in others' minds) after we die. 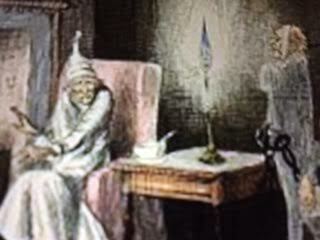 In A Christmas Carol, the 1843 novella by Charles Dickens, Scrooge is haunted by the Ghosts of Christmas (past, present and future). These spirits awaken in him an awareness of death that transforms him from a bitter and miserly man into a generous one. By giving to others, he experiences the joy that had been missing in his life. After his death he will be remembered for enhancing others' lives. In her 1940 book, The Moral Basis of Democracy, Eleanor Roosevelt encourages us to prioritize the well-being of others and to choose love and faith over hatred and fear. Living by her tenets creates positive memories of our lives. If we follow Becker's thinking, an awareness of death, coupled with the idea that we live on in symbols of good memories, can help us accept death and create peace in our world. Conclusion: Acknowledging the dualism between body and symbol in an awareness of death motivates us to live life to its fullest and to heal the world.